FOOTWEAR RAISES AND REMEDIAL ADAPTATIONS TO FOOTWEAR. YOU DO NOT HAVE TO SUFFER FOOT PAIN AND ASSOCIATED FOOTWEAR PROBLEMS, AS RELIEF IS ONLY A PHONE CALL AWAY. I OFFER A FREE NO OBLIGATION, OVER THE PHONE CONSULTATION TO DISCUSS YOUR FOOT, GAIT AND FOOTWEAR PROBLEMS. just give me a call, email or text me your name and contact number and i will call you back as soon as i can. DISCOUNT on an Adult’s 2 PAIR ORDER ! If you order 2 pairs of Adults orthotics when you place your first order you will get the special price of £340 for 2 pairs. So if you need one pair for sports or leisure use and also a thin pair for smart or stylish footwear, then this discount is for you. DISCOUNT on a Children’s 2 PAIR ORDER ! if you order 2 pairs of Children’s orthotics when you place your first order you will get the special price of £260 for 2 pairs. so if your child needs one pair for sports or leisure use and also a thin pair for school shoes or smarter footwear, then this discounts for you. Visit – Consultation and Assessment £35 (£25 after cash back) £10 Cash Back When An Order Is Placed For Orthotics or Footwear. Hatfield, St Albans, Welwyn Garden City, Brookmans Park, Hertford and Potters Bar. £10 Cash Back When An Order Is Placed For Orthotics or Footwear. Hitchin, Letchworth, Kings Langley, Hemel Hempstead, Enfield, Cheshunt, Barnet, Radlett, Knebworth and Watford. If you have ever experienced aches, pains or twinges in your feet and legs while standing, walking, exercising or taking part in sport, this may well be due to poor alignment of the feet and lower limbs. 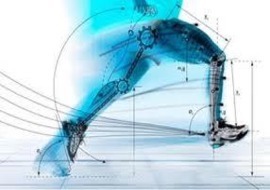 The biomechanics of the feet and lower limbs refer to the complex series of movements that enable walking and any anomalies in this process can lead to pain – not only in the feet, but elsewhere in the body such as ankles, legs, Knees, hips and back. An Orthotic Specialists can examine your walking characteristics to identify any biomechanical problems, and check to see if the joints and muscles in your feet and legs are functioning normally. They can then prescribe and manufacture corrective devices called orthotics to help resolve your condition which can be used by Adults and Children for every day use or sporting activities, where as a podiatrist would send your details and prescription off to a third party to manufacture your orthotics even though they have never seen you feet and if you also needed a raise or footwear adaption added to your footwear you would find that a podiatrist would not be able to carry this work out for you. In some cases, to resolve your problems it is best to prescribe a combination of orthotics and footwear adaptions, for example someone with different leg lengths, unless the difference between the legs is only a few millimeters and a compensating raise can fit inside their footwear then the compensating raise would need to be fitted to the outside of their footwear with orthotics worn inside their footwear to hold and realign the feet. Orthotics are designed to alter the way your feet and legs work, restoring more normal function and relieving stress on the painful areas. 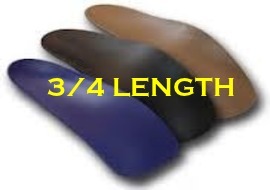 They can be manufactured from a number of different materials, ranging from soft foams to firm high density EVA, and are normally designed to the customer’s needs and their desired use, so they could be full length or 3/4 length, very thin for smart or stylish footwear or a moulded EVA pair for sports and leisure footwear. I manufacture Custom made Orthotics for Adults and Children, as well as carrying out footwear adaptations and producing hand crafted custom-made footwear at my workshop in Hatfield to help people who may experience pain or discomfort when they walk or take part in sporting activities or are suffering with foot and footwear problems, My services are on a call-out basis which involves travelling to your place of residence, workplace, hospital, clinic, gym etc, then assessing your problems then advising on the available options, once the appropriate option has been agreed I then take the details, measurements and impressions of your feet to begin the orthotic or footwear development process and once the orthotics, footwear or footwear adaptations are completed they are delivered to you, which can be of great benefit for those who have painful feet, difficulty getting about or have busy lifestyles. Areas covered:- HERTS, NORTH LONDON, GREATER LONDON AND THE HOME COUNTIES. Whether you enjoy running, skating, skiing, football, rugby, ice hockey or inline hockey and most other sports, professionally or just for pleasure, your health and fitness is the key. But what happens if suffer an injury or you suffer from a medical condition that affects your feet, ankles, knees or other part of your body? As well as damaging your performance, poor treatment could hinder your recovery, custom-made orthotics are the answer. 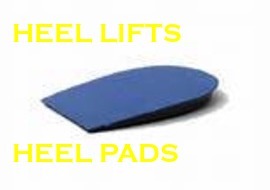 Insoles, Combination Insoles, Cradles, Foot beds, Arch Supports, Valgus Insoles, Metatarsal Insoles, Met Supports, Heel Lifts, Heel Pads, Heel Supports, Heel Raises, Toe Blocks, Toe Fillers. 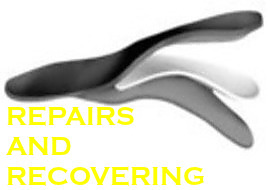 REPEATS, REPAIRS, REFURBISHMENT AND AFTERCARE. I have pride in the provision of my Orthotics services and ensure that you have access to efficient and effective repairs and aftercare. 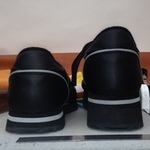 I can manufacture a copy of an existing pair of orthotics, supply a repeat order or a revised pair for a different type use or activity or for a different type of footwear. and repair or replace their heel posting blocks to extend their life. 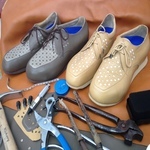 Most people interested in custom-made orthopaedic footwear are looking for the remedial qualities of the footwear usually comfort, support, pain relief and improved mobility, my hand crafted orthopaedic footwear can provide these while keeping in mind that bespoke orthopaedic footwear can still be stylish as I also take great pride in style aesthetics of the footwear I produce. 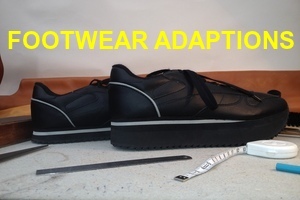 to adjust for differences in leg length, and other foot, leg, back and joint problems to improve function, gait and help relieve pain whether used with or without orthotics, this is usually achieved by fitting an outside raise to the sole and heel of the footwear and in some cases also include a small raise on the inside of the footwear also wedges, floated or flared heels, rocker soles etc can be fitted if required. If you already have someone dealing with your problem or someone over seeing your healthcare I’m happy to liaise with them (doctor, podiatrist, physio, surgeon, healthcare staff etc). AREAS COVERED:- HERTS, LONDON AND THE HOME COUNTIES.